There’s a ship down at the dock. There are places for a few, but not many. If you have enough money and know the right people, you might get a ticket. A war torn country… a town that is burning. A single ship waits at the port for those who can escape. How can a boy and his grandfather hope to get on board? And will they find his mother before it leaves? When Papa meets two old friends, he makes a deal that could save them all. But this is only the beginning of the journey for Malik. If he is to escape, he will need all of his courage, his sense of right and wrong and a magic trick that he must practise until it’s perfect. Lots of impressive fiction on the newly independent DFB list but this one stood out for me. With echoes of Sonya Hartnett and John Boyne, a young boy and his grandfather try to flee a war-torn land. Incredible, suspenseful writing. An astonishing debut about war at the most human level, told through the eyes of a young boy fleeing an unnamed country. It has the fable-like quality of Sonya Hartnett and I read it in one sitting. This original and cleverly plotted tale of betrayal, sacrifice and ingenuity illuminates the refugee experience in any place or time. 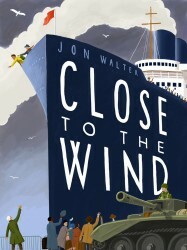 Jon Walter has crafted a fine story of what it means to be human, how a changing world doesn't mean the end of all things and that life must go on even in the face of immeasurable loss. I really can't wait to see what he writes next. A perfect read for our age – a perfect vehicle for empathy with those fleeing their homelands, for any child lost in an adult world.